*This can be used on all Acratech Ballheads except the GP, GP-s and the GP-ss. For the GP, GP-s and the GP-ss use our GP/GPS Quick Release Locking Lever Clamp. 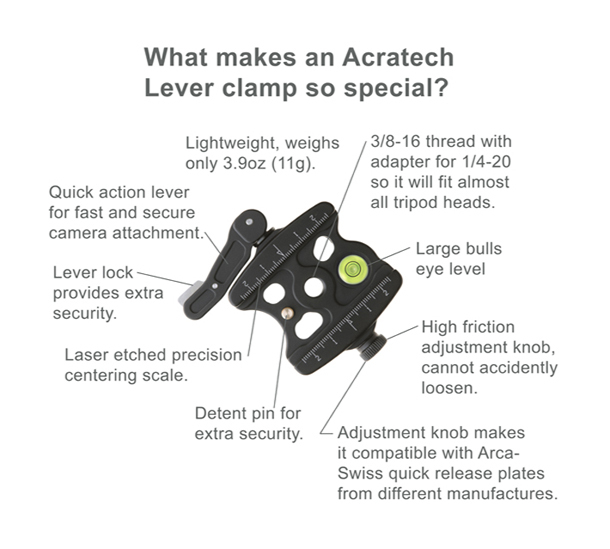 This is the video instruction manual and tutorial for our Acratech Quick Release Locking Lever Clamp. So please Enjoy, Subscribe, Thumbs Up, and Share! We appreciate it!! http://www.acratech.net/ Brought to you by Scott Dordick of Acratech ------------- So don't forget to Subscribe to our YouTube Channel... http://www.youtube.com/channel/UCuLMG... Check out our Website: http://www.acratech.net/ Follow Acratech on Facebook: https://www.facebook.com/pages/Acrate... Follow Acratech on Twitter: https://twitter.com/Acratech Thanks! I was in need of a gender changer for a specialized tripod head. I already own the Acratech quick release products. This locking lever clamp was a life saver. Perfomed to its specifications and very quickly was permanently and securely attached to the specialized tripod head and as its name implies it fulfilled its purpose. Now, is as if I have another Acratech tripod head in my inventory. I've now used the locking lever clamp for a couple of weeks now and it works even better than I anticipated. I spend a great deal of time out in the mountains of Colorado and during the short time of sweet light at sunrise or sunset I often have to cover a large area, carrying my camera and tripod from place to place, often climbing rocks, up the side of waterfalls, or across tricky terrain. In the past I would put my gear away each time I moved. Now, I feel comfortable leaving my camera on the tripod as I move from place to place, knowing that it won't fall off. It is totally secure on the ballhead. It has been a great change to my work routine and as always the quality is top notch. Achratech never does anything half way. I have three of plates and they work very well. Once you adjust the closing and locking lever you should almost never have to mess with again. With just a squeeze of the locking lever your camera is now release or just pull it to the locked position and it will not move. The brass pin is a great safety feature, it keeps you camera from sliding off. It has saved me some very expensive repairs. The price seems a little spendy but what is your camera worth. Everything on it is made to last a life time and works well. I've had one of them for over two years and it has gotten banged a few times. I had a monopod and tripod I needed to adapt these to. My mono pod required me to counter sink the screw hole to fit screw from the mono pod. That worked very well just like it was designed to do. I actually did not have to do anything to this unite. I made a small shim plate for underneath and then ground a curved slot in my tripod so the tightness adjustment housing fit right into the tripod. Everything works great. I love Acratech products because they are strong, well designed to last forever.